This is second of the yummy goodies I made for a cake stall at Oscar's kindy this weekend. You can see the Triple Chocolate Brownies here. To me these biscuits/cookies just scream childhood. I mean, what kid doesn't love sprinkles?? These hundreds & thousands contained no artificial colours or flavours, and this is something I cam starting to notice more and more. Such a good thing although I know some kids (and adults) do react to natural colours and flavours as well. I adapted the recipe for these beauties from Averie Cooks. Hers were for Chewy Sprinkles Cookies. They were much smaller and baked for less time so they come out of the oven very blond. However, my perfect biscuit is crispy on the outside and chewy in the middle so that's how I made them. I love the golden brown colour and their sweet buttery aroma was incredible. I think I showed great restraint not tasting even one of these, but I gave one to my littlest taste tester Charlie and he gave it a huge thumbs up. Why not make these this weekend? You won't be disappointed! Place the flour, salt and baking powder in a medium bowl and whisk together to combine. Set aside. In a stand mixer or large bowl using a hand mixer, cream together the butter and sugars at medium-high speed until light and fluffy. Stop and scrape down the sides of the bowl and add the egg and vanilla. Beat for 30 seconds, until just combined. 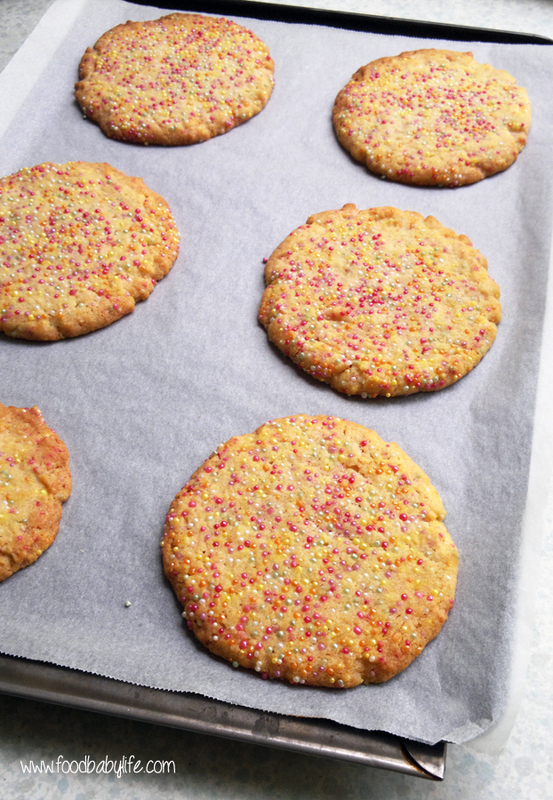 Switch to a spatula and fold through the flour and sprinkles until just combined. Wrap the dough in plastic wrap and refrigerate for at least 2 hours (or up to 5 days) before baking. Preheat oven to 180 degrees C / 160 degrees fan-forced. Line 3 baking sheets with baking paper and set aside. Divide the dough into 18 balls (my batch of dough weighed 968g so I got 18 x 54g pieces from the batch). Roll each ball in the extra sprinkles and place on the prepared trays, 6 per tray leaving plenty of room for spreading. Use your hand or lightly grease the bottom of a glass to flatten each ball to about 1cm thick. 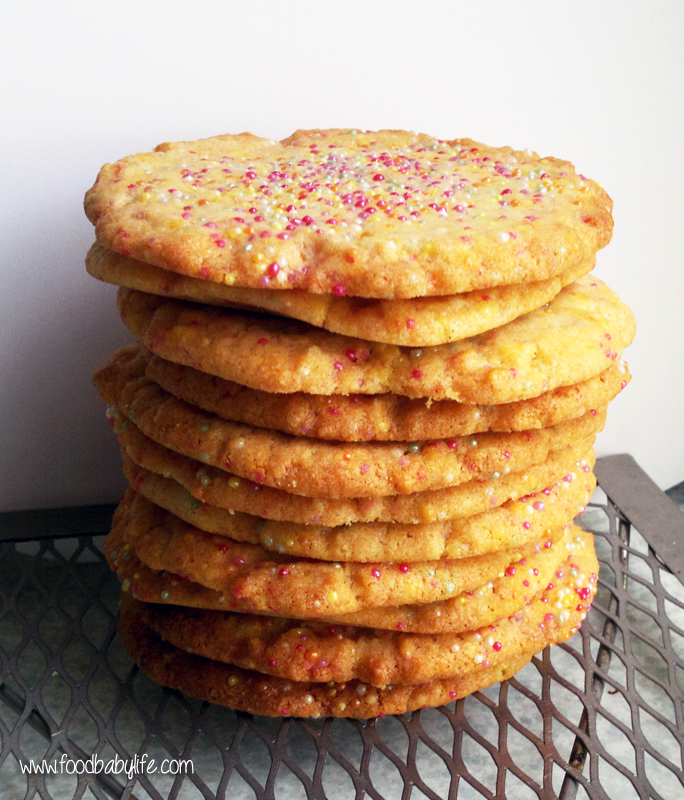 Depending on your oven size you can bake these all at once or in batches. I did 1 tray at a time, with the remaining trays waiting in the fridge. Bake for 12 minutes, rotating the trays halfway. They will be just golden brown around the edges and pale golden in the middle. Remove and allow to cool on the tray for at least 5 minutes before carefully lifting them onto a wire rack to cool completely. They will firm up as they cool. Store the biscuits in an airtight container at room temperature for up to 5 days or in the freezer for up to 3 months. You can also store unbaked cookie dough in an airtight container or plastic wrap in the fridge for up to 5 days before baking. WINNER UPDATE - AntiOx Chocolate Giveaway!